July 1st is Canada Day! Canada is 142 years old, so have a drink for Canada. And... is there any better way to celebrate a country and its heritage and its achievements, then by having a sale? A sale especially for Canadians? Great idea! 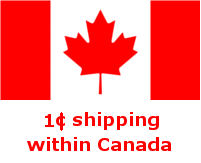 I'm offering 1 cent shipping to all locations in Canada from MyHandboundBooks and MyMarbledPapers. So, just 1 penny for shipping until midnight July 1st (or whenever I get home from the fireworks and celebration, whichever is later)!